Holder-Mate engineer team provides a good solution to charge Apple Watch, iPhone/iPad and Airpods at the same time by one charging station - sturdy, neatly, and organized. watch from scratching, and the watch will be charged everytime when you put your watch on. It also helps you to avoid forgetting charging your watch in the night. workable with your airpods case, no need to take off the airpods case when charging. 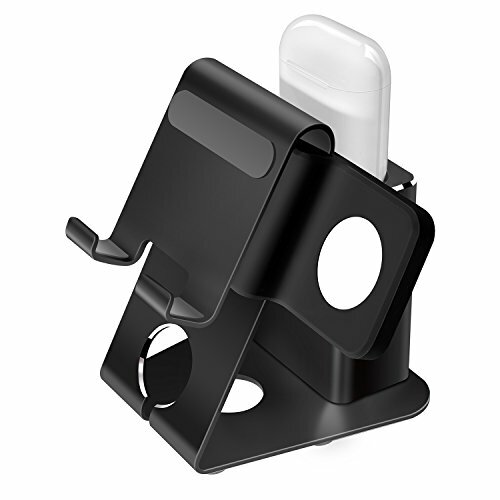 The iPhone stand provides a 60 degree angle to meet your viewing when using Facetime, YouTube, Twitter, Facebook, Emails and cooks from a recipe online. Silicone pads of hooks and bottom protect your phone from scratching and sliding. Cable Management: Sturdy, Neatly, and Orginazed Cable Management. Looks Good and Elegant. If you have any questions about this product by Holder-Mate, contact us by completing and submitting the form below. If you are looking for a specif part number, please include it with your message.